Bamboo fabric. Reputedly softer than the softest cotton on the market today. Believe it. My blue bamboo scarf feels so good around my neck, I never want to take it off. In fact, sometimes I don't. Since scarves are the accessory of the season (or is it the clutch? depends on who you read), I feel quite good about it becoming my accessory of the season. Plus it's made from bamboo - good for the planet and good for me. regulating and odor free. 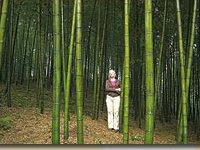 Bamboo is grown without fertilizers, pesticides or insecticides and is biodegradable. My scarf is made with non-toxic and AZO free dyes. 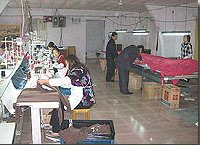 Since bamboo is grown in abundance in China, this is where the majority of bamboo clothing is made. Banish any environmental concerns however, as the U.S. company that actually made my scarf keeps a watchful eye over the process of breaking down the bamboo stalks to make them into fibre and has close relationships the factories and workers, ensuring they're aligned with the vision of providing nurturing natural products while consciously caring for people and the environment. The factory that sews the fabric has expanded in the last three years, employing more local women from the village and bringing in more family members. So there it is. Feel good wearing it, feel good about wearing it. Our brand new bamboo line has just arrived in time for Christmas - not only is it chic, it's surprisingly affordable. Scarves like mine from $23, matching lightweight hats for him or her for just $21, plus there's heavenly nightshirts that double as day wear and gorgeous wraps in a lovely mushroom brown or classic go-with-absolutely-everything black. Shop Lavish & Lime for super soft bamboo clothing accessories and a great selection of other great green gifts. In this time of the holiday season the thought of trying to figure out what to get all the diverse people that we have on our list is sometimes insane. I gave some thought and have figured out the following for people I know. Perhaps this might give you a thought about it. First and foremost, for the children. I have grown to feel that the best gifts for kids should not just be for fun and they don't have to be. Technology has grown and certain companies have followed suit in providing lines of products that both teach and allow fun. Fisher Price is just that. The tag line Play, Laugh, Grow says it all. I just got the Learning Pony for my 2 year old neice. This thing is awesome. First stand alone it's a fun thing for the child to play on and pretend they are a cowboy. Second, it has a slew of games made for the very young all the way up to children of three years old. Second, how about something classy and useful. I just went to a site and purchased a Grandfather Clock, but one that was made for a desk. The specific product I got was a Baxter Table Clock and was only $56.00, not including shipping and handling but that was only another $20. I got this for my uncle who has a great desk and study.